I met my college roommate the day we moved into our freshman dorm. Months earlier, I filled out a survey and ta-da; there she was with her entire life in tow. She seemed nice enough and although we weren’t the best of friends, we got along fine. One night, she didn’t come home from a party and since this was before cell phones were a thing, a few of my friends and I went to find her. We found her alright – completely wasted and unsure how to get back to the dorm. We helped her find her way back, got past the security guard and R.A. before we practically carried her up two flights of stairs to our room where she promptly passed out on my bed. It was then that I knew I was officially in college. Unfortunately, she turned rather mean as the semester went on and I decided to move to another room which turned out to be a much better fit. I’m reminded of this story because today we met my daughter’s roommate at Admitted Students Day. They have been Face Timing each other for the past month and a half and when they saw each other they embraced as if they had known each other for years. 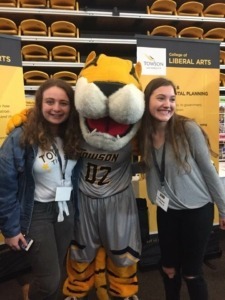 They were adorable and inseparable–taking selfies and walking shoulder to shoulder through the student activities fair remarking on how cute college boys are and how awesome it was to be there. We parted ways with her family after lunch and they were texting each other on the way home. I can only hope that they stay friends and avoid the girl drama that high school tends to bring on. I hope they help each other navigate their way around campus and inevitably back from college parties. It’s an exciting time for her and for all of us. It is the beginning of a new era and I can’t wait to see what happens next. Times have changed. It’s nice that potential roommates can “meet” each other before the formal introduction. Most of my college friends and I have drifted apart, although I am still in contact with one. I hope your daughter and her roommate are able to be friends through the years.